* A Comprehensive range of Precision Universal Joints for specific applications is available to the Indian Industry. * Range covers outside diameters from 10 to 95 mm - all confirming to DIN standards. Single, double & extendable type joints are available in all 3 varieties. C N.m. SERI No. 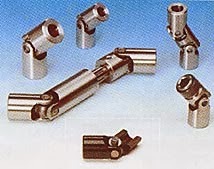 B A BROE SIZE C E N.m.
Introduction : OKI Universal Joints provide a simple & economic method of connecting two shafts whose axes are inclined at an angle. They are also used when the angle varies during rotation eliminating the need for the complicated & expensive mechanisms usually associated with this type of application. Lubrication : For both intermittent & continuously rated joints where constant lubrication (such as an oil bath) is not available joint covers for grease packing are recommended. U joint, Cardan joint, Hardy-Spicer joint, or Hooke's joint is a joint in a rigid rod that allows the rod to 'bend' in any direction, and is commonly used in shafts that transmit rotary motion. It consists of a pair of hinges located close together, oriented at 90° relative to each other, connected by a cross shaft. We also undertake repairing of propeller shafts , universal joints , cardan shafts , transmission shafts , drive shafts , cross joint , u joints , u j joints . We also deal in spares of propeller shafts , universal joints , cardan shafts , transmission shafts , drive shafts , cross joint , u joints , u j joints .